Julius Bolton, proprietor of Cigar City Club on Roswell Road in Sandy Springs, plans to open a sibling concept, a sports bar, in the coming weeks. Cigar City Sports Bar is expected to open in about two months just south of Cigar City Club, in a space previously home to Sunlighting lamp and shade center. Lao Street Food eatery Snack Boxe Bistro, which indicated last week they were planned to open this past Monday, January 15, has delayed their opening. The restaurant announced January 12 that "unforeseen circumstances beyond our control" led to the delayed opening but they did not say when the restaurant will now open. Snack Boxe Bistro is located in Peachtree Pavilion, the Hmart anchored center in Doraville, also home to Shoya Izakaya, and Kula Revolving Sushi Bar, among other businesses. The McDonald's at 920 Windy Hill Road in Smyrna has closed. A new car wash is planned for the site of the former QuikTrip at Sandy Plains and Scufflegrit Roads in East Cobb. FedEx Office has closed its location at the Northlake Quadrangle Office Park on Northlake Parkway. FedEx informed customers by email of the closure earlier this week, directing them to the nearby location at 4805 Briarcliff Road nearby. Old Hickory House, which is also located in the office park, is reportedly staying put, while a freestanding frozen in time Steak & Ale restaurant was demolished earlier this week. Plans call for the property to be redeveloped into senior oriented apartments. Wells Fargo announced plans earlier this month to close 800 [more] branches by 2020. The planned closures, would leave Wells Fargo with about 5,000 branches. The bank closed more than 200 branches last year, but still finished the year with more than 5,800, the most in the United States. On a conference call with analysts, Wells Fargo cited Americans' increasing preference for online and mobile banking as the primary reason for the planned closures. "We will have as many branches as our customers want for as long as they want them," said John Shrewsberry, the chief financial officer. With so many planned closures, there are sure to be plenty of sites coming available for redevelopment. At least one Wells Fargo branch that closed last year is already being repurposed. Hoover Foods, a local Wendy's franchisee, plans to open a new Wendy's in place of a shuttered Lawrenceville area Wells Fargo bank branch later this year. 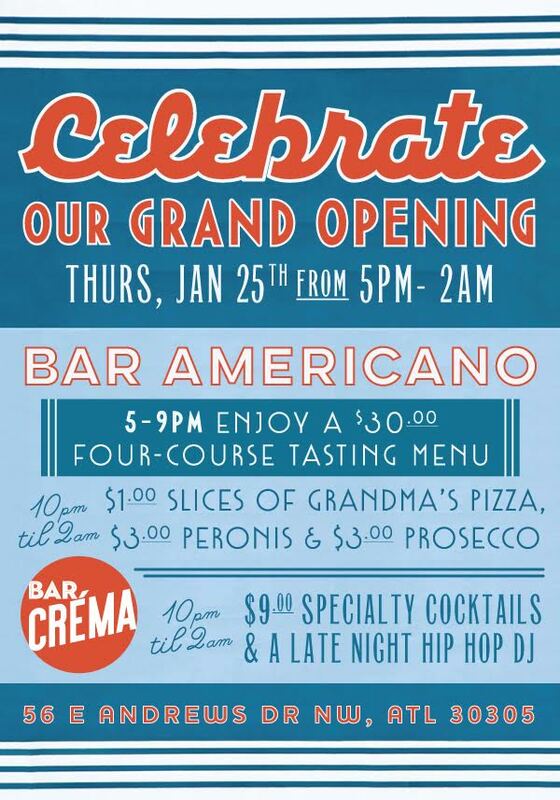 Bar Americano and Bar Crema will celebrate their Grand Opening with assorted specials this Thursday, January 25th. 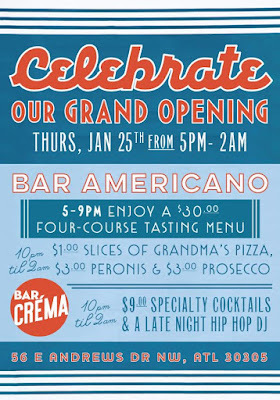 The restaurants, both located in Andrews Square on East Andrews Drive in Buckhead, will offer specials during the day and "after hours," between 10PM and 2AM. The Merchant is closing its Howell Mill (993 Marietta Street) store by the end of the month. The store, proprietor Dan Collier's first, opened in October 2013 and was later followed by locations at Krog Street Market and Lenox Square, both of which will remain open. An out of state outpost in Dallas opened last month and will also remain open. The Howell Mill store is expected to close no later than January 31, but with all in-stock merchandise 50% off, it may close sooner. Barberitos has closed its location in the Goodwill anchored shopping center at the corner of Alpharetta Highway & Mansell Road in Roswell. The restaurant reportedly closed at the end of the year. Neighboring business The Counter followed in turn, closing Sunday, January 7. Last week, Walmart abruptly closed 63 Sam's Club stores including one in metro Atlanta, in Lithonia, near The Mall at Stonecrest. When word of the sudden closures emerged, Sam's Club tweeted "After a thorough review of our existing portfolio, we’ve decided to close a series of clubs and better align our locations with our strategy. Closing clubs is never easy and we’re committed to working with impacted members and associates through this transition." Ten of the affected stores will be turned into e-commerce distribution centers, and employees of those stores will have the opportunity to reapply for positions at those locations, a Walmart official said. Among the other closures were three stores in Alaska (two in Anchorage and one in Fairbanks) and the others across Puerto Rico. In related news, Walmart plans to close their Walmart Neighborhood Market store at 6152 Covington Highway, also in Lithonia, by the end of the year. The store opened in 2014 in place of a former Ingles supermarket. New Realm Brewing is now open on Somerset Terrace, near Two Urban Licks, along the Atlanta BeltLine. The restaurant & brewery features a menu crafted by Julio Delgado, most recently of JP Atlanta at Hotel Indigo Downtown. 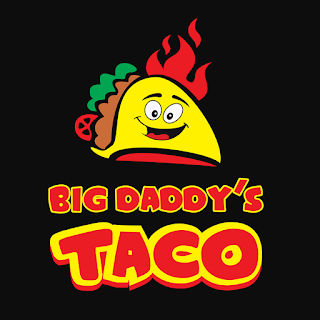 ATL Taco is now open in place of Bantam & Biddy at Lenox Square. Tom Murphy has sold Morningside Kitchen to a consortium of investors led by Blaiss Nowak, son of Hal Nowak of Hal's on Old Ivy. Nowak reportedly plans to convert the restaurant to an as yet undetermined new concept. Millwood, New York-based, private-equity-owned Mavis Discount Tire quietly purchased Atlanta based Kauffman Tire earlier this month. The deal, of which financial details were not disclosed, gives Mavis an immediate presence in the southeast and allows Kauffman to focus on their wholesale distribution business. Kauffman Tire was founded by Harry Kauffman in 1936. His son, the late John Kauffman, moved the company's headquarters in 1975 to Atlanta from Ohio. At the time of the purchase, Kauffman Tire operated 69 locations throughout Georgia and Florida. Kauffman was considered the 17th largest independent tire retailer in the U.S., according to Tire Business' most recent Top 100 ranking. Kauffman Tire CEO Mark Kauffman called the deal an "excellent development in Kauffman Tire's history. We're pleased our retail stores will continue to be operated by a family-run business and feel this is a natural fit and great outcome for our employees and customers. We can now turn our attention to focus on growing our significant wholesale distribution business." In preparation of this post, ToNeTo Atlanta discovered an article from last April that seemed to predict the merger. The Little Farmhouse Cafe on Presidential Parkway near Tucker celebrated its Grand Opening January 9. The business, which is open Monday through Friday for breakfast and lunch from 8am until 3pm, also offers catering. Known to to some as "MRD Foods" from their offerings at the Tucker Farmers Market, the eatery already has a local following which will hopefully enable them to overcome their off the beaten path location. The eatery is located at 3795 Presidential Parkway Suite FP-8, off Chamblee Tucker Road, not far from Mercer University. Breakfast and lunch eatery First Watch will open its new Chamblee restaurant tomorrow, Monday, January 22 at Peachtree Station. The restaurant, which ToNeTo Atlanta was first to announce this past August, is opening in space previously leased to YEAH! Burger. Bradenton, Florida-based First Watch has expanded its Georgia footprint since entering the market in 2013. First Watch purchased two (corporately owned) J. Christopher's restaurants (Johns Creek and Smyrna) in late 2012, and reopened them as First Watch in January 2013. Today, First Watch operates eight locations in Georgia including Kennesaw, Snellville, Alpharetta, Johns Creek, Dunwoody, and near Decatur in Fuqua Development's Decatur Crossing. Circuit City will relaunch its website on February 15 with plans to open shop in shops, kiosks and its own showrooms, eventually, according to company CEO Ronny Shmoel. Schmoel, who purchased the brand, domain and associated trademarks for Circuit City in October 2015, detailed his plans at CES [Consumer Electronics Show] earlier this month in Las Vegas. Circuit City, once a national brick and mortar electronics retailer, closed all of their stores, including many in metro Atlanta, after filing for bankruptcy in 2008. German grocer Lidl is reportedly reconsidering its growth plans in the United States, abandoning some stores while electing to build other, smaller stores. The discount grocer entered the U.S. market last year with 49 stores and had plans to have at least 100 stores open by the end of 2018. Current U.S. Lidl stores are 36,000 square feet with real estate sources indicating the retailer may be looking to open new stores closer to 18,000-20,000 square feet, closer in line with the size of Aldi stores. Thus far, only one Lidi store has opened in Georgia, in Augusta. It's unclear what the status of stores planned for metro Atlanta is, including those in Austell, Mableton and Snellville, among others. Phoenix, Arizona based Sprouts Farmers Market plans to open its 17th Georgia store in Augusta later this spring. The store, which will anchor a new shopping center on Walton Way Extension, just off I-20, is expected to open May 2. Marcus Lemonis, star of CNBC's The Profit, and owner of Camping World Holdings, announced earlier this month that he will reopen 69 former Gander Mountain stores by this coming May. Lemonis purchased the bankrupt retailer last year, and after months of negotiations, will relaunch the retailer as Gander Outdoors. Of the six former Georgia locations, only one is being reopened under the new banner, in Augusta. The retailer could reopen other former locations or open new locations in the months and years to come. Old Navy plans to soon begin a remodel of their 15,000 square foot store at Buckhead Station in Buckhead. The remodel should be competed later this spring. F45 Training plans to open a second Atlanta area location, this at Modera Sandy Springs on Rowell Road in Sandy Springs. The Australian company's first Atlanta area location opened this past June on Pharr Road at The Shops Buckhead Atlanta. The Sandy Springs studio will be 3,000 square feet. After numerous delays, the new Max's Coal Oven Pizzeria at Perimeter Mall in Dunwoody opened Friday, January 12. The pizzeria, which was first announced to be opening at the suburban mall this past February, originally targeted a spring 2017 opening. Max's replaces the short-lived Varasano's Pizzeria which opened at Perimeter Mall in October 2015, after delays of its own, but closed in June 2016. The original Max's opened in downtown Atlanta as part of the Luckie Marietta District on Marietta Street in 2009. Originally developed in partnership with Concentrics Restaurants, Max's is today a concept owned entirely by Legacy Ventures. Max's at Perimeter Mall is more than 5,000 square feet, significantly larger than the 3,700 square foot Luckie Marietta location. Later this summer, Legacy plans to open a third Max's at Cinnamon Shore, a new development on the Gulf of Mexico on Mustang Island, Texas. In other Perimeter Mall food news, The Pub closed in the space adjacent to Max's, and is reportedly already drawing strong interest from restaurant operators. Congratulations to former restaurateurs turned fish fry business owners Joe and Maranda Dowell who last week got a deal with "shark" Daymond John on the hit ABC series Shark Tank. The Dowells, who relocated to Atlanta following hurricane Katrina, sought a $150,000 investment in their business, Joe's Gourmet Fish Fry, in exchange for a 15% stake in their business. They ultimately accepted John's $150,000 offer for a 25% stake. 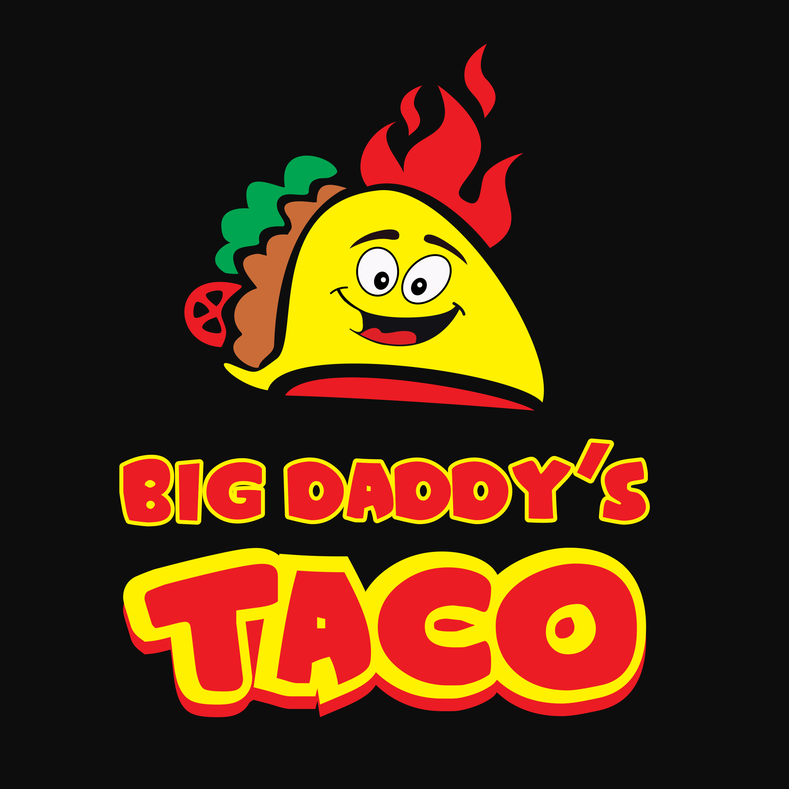 A new taco joint called Big Daddy's Taco recently opened in the short-lived Cafe Bello on Chamblee Dunwoody Road, across from Chamblee High School. Boardroom men's salon is coming soon to Brighten Park. The upscale men's salon entered the Atlanta market last year with a location at Avalon in Alpharetta. Fifth Group Restaurants opened its fourth overall South City Kitchen restaurant Thursday at The Hotel at Avalon in Alpharetta. The new outpost joins existing locations in Midtown, Vinings and Buckhead. Vietnamese eatery Pho Dai Loi recently opened their new location in Chastain Square in north Buckhead. Pho Dai Loi replaced the failed "better burger" joint Burger 21 which closed this past June after less than two years in business. The Buckhead outpost is Pho Dai Loi's fourth restaurant overall, joining existing locations on Jonesboro Road in Forest Park, Buford Highway in Chamblee and on Pleasant Hill Road in Duluth. A new healthy eatery called Press Blend Squeeze recently opened in Dunwoody Village. The eatery, which specializes in fresh cold pressed juices, wraps, acai bowls, salads and cleanses, occupies a 900 square foot space in The Fresh Market anchored center. Popular bagel makers Emerald City Bagels has delayed the opening of their first ever brick & mortar location in East Atlanta Village. Charleston-based Garden & Gun Magazine confirmed plans earlier this week for its previously announced location at The Battery Atlanta to open as their first ever Garden & Gun Club. The company describes their new endeavor as "A new cocktail and Social club from Garden & Gun." There will be no membership requirement for the club that will be open for lunch and dinner, as well as for coffee or cocktails. The company anticipates opening this coming spring and promises that patrons will "enjoy the start of a new chapter in Southern hospitality." Palm Beach Tan, the nation's largest indoor tanning provider, announced Tuesday that it has acquired Atlanta-based Solar Dimensions tanning salons. The acquisition, which more than doubles the Palm Beach Tan footprint in the Atlanta market, includes all Solar Dimensions branded salons, but does not include one Solarium salon in Alpharetta. Founded in 1990, Palm Beach Tan, Inc. operates more than 460 locations, both corporate and franchisee owned, under the brands Palm Beach Tan, Palm Beach Tan Sunless, and Planet Tan. Was at Peachtree pavilion last night and there are 5 or 6 coming soon signs for restaurants in addition to twice that many other nail and hair boutique fitness salon etc. Who knew that center was popping?! I liked going to happy hour at The Pub because you could buy a schooner (14 oz.) of any draught beer (good British/Irish selections) for $3. The bar itself was a piece of art. Was business that bad or was the rent just outrageous? F45 is also open in Alpharetta. John's Creek is supposedly opening sometime soon. I live right near The Pub and never tried it. When going to dinner it was never a place that crossed our minds. Maybe they could have used a little marketing? I never heard anyone talk about it - good or bad. That space must be the black sheep as Cheesecake and Maggianos both still kill it there. We went to Cowfish last Friday and they were close to an hour wait (although they quoted 25-30 minutes or we would have never waited that long). It's a whole lot of things closing in Atlanta. I think the city is in the early stages of a massive economic recession.